Rakhshkhorshid, M., Rastegari, H. (2016). Neural Network Prediction of Warm Deformation Flow Curves in Ferrite+ Cementite Region. International Journal of Iron & Steel Society of Iran, 13(1), 15-19. M. Rakhshkhorshid; H. Rastegari. "Neural Network Prediction of Warm Deformation Flow Curves in Ferrite+ Cementite Region". 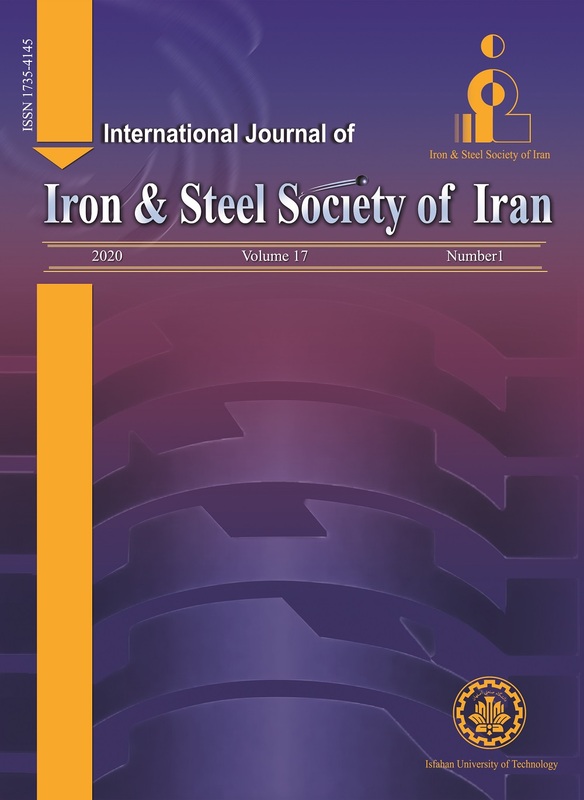 International Journal of Iron & Steel Society of Iran, 13, 1, 2016, 15-19. Rakhshkhorshid, M., Rastegari, H. (2016). 'Neural Network Prediction of Warm Deformation Flow Curves in Ferrite+ Cementite Region', International Journal of Iron & Steel Society of Iran, 13(1), pp. 15-19. Rakhshkhorshid, M., Rastegari, H. Neural Network Prediction of Warm Deformation Flow Curves in Ferrite+ Cementite Region. International Journal of Iron & Steel Society of Iran, 2016; 13(1): 15-19. Many efforts have been made to model the the hot deformation (dynamic recrystallization) flow curves of different materials. Phenomenological constitutive models, physical-based constitutive models and artificial neural network (ANN) models are the main methods used for this purpose. However, there is no report on the modeling of warm deformation (dynamic spheroidization) flow curves of any kind of steels. In this work, a neural network with feed forward topology and Bayesian regularization training algorithm was used to predict the warm deformation flow curves of a eutectoid steel. The experimental data was provided by sampling the dynamic spheroidization flow curves of the tested steel obtained from warm compression tests conducted over a temperature range of 620-770 °C with different strain rates in the range of 0.01-10 s-1. To develop the neural network model, the overal data was divided into three categries of training, validation and testing. The scatter diagrams together with the root mean square error (RMSE) criterion were used to evaluate the prediction performance of the developed model. The low calculated RMSE value of 4.15 MPa for the overall data showed the robustness of the developed ANN model in predicting the warm deformation flow curves of the tested steel. The results can be further used in the mathematical simulation of warm metal forming processes. M. Rakhshkhorshid: Int. J. Adv. Manuf. Technol., 77(2015), 203. T. Sakai, A. Belyakov, R. Kaibyshev, H. Miura, and J.J. Jonas: Prog. Mater. Sci., 60(2014), 130. H. Mirzadeh and A. Najafizadeh: ISIJ Int., 53(2013), 680. H. Mirzadeh: Mech. Mater., 77(2014), 80. Y. C Lin, X. M Chen: Mater. Des., 32(2011),1733. X. Xiao, G. Q. Liu, B. F. Hu, X. Zheng, L. N. Wang, S. J. Chen, A. Ullah: Comput. Mater. Sci., 62(2012), 227. G. L. Ji, F. G. Li, Q. H. Li, H. Li, Z. Li: Mater. Sci. Eng. A., 528(2011), 4774. R. Haj-Ali, H. K Kim, S. W. Koh, A. Saxena, R. Tummala: Int. J. Plasticity., 24(2008), 371. S. Mandal, P. V. Sivaprasad, S. Venugopal, K. P. N. Murthy, B. Raj: Mater. Sci. Eng. A., 485(2008), 571. Y. Sun, W. D. Zeng, X. Ma: Intermetallics.,19(2011), 1014. H. Rastegari, A. Kermanpur, A. Najafizadeh, D.Porter, M. Somani., J. Alloys. Compd., 626(2015), 136. M.S. Ozerdem, S. Kolukisa: Mater. Des., 30(2009), 764. L. Gavard, H. K. D. H. Bhadeshia, D. J. C. MacKay,and S. Suzuki: Mate. Sci. Tech., (1996), 453. F. D. Foresee, M. T. Hagan, Int. Joint Conf. on Neural Networks., (1997), 1930. MATLAB®software,R2008a,Neural Network Toolbox,User’s Guide, 2008. M. Rakhshkhorshid, S.H. Hashemi: World J. Eng. phys. Sci., 2(2014), 080.